Identification of planetary companions of giant stars is made difficult because of the astrophysical noise, that may produce radial velocity variations similar to those induced by a companion. The goal of this study was to determine the origin of the Doppler periodic variations in the K giant star TYC 4282-605-1 observed by HARPS-N in the visible band and verify if they can be due to the presence of a companion using near IR observations. In the frame of the programme Global Architecture of Planetary Systems (GAPS), a total of 48 high resolution spectra were collected with the high resolution spectrograph HARPS-N at the Telescopio Nazionale Galileo (TNG). At the same time, an observational campaign was conducted with the high resolution spectrograph GIANO at the TNG to monitor the NIR radial velocity, in order to verify whether the near-IR amplitude variations were comparable with those observed in the visible. 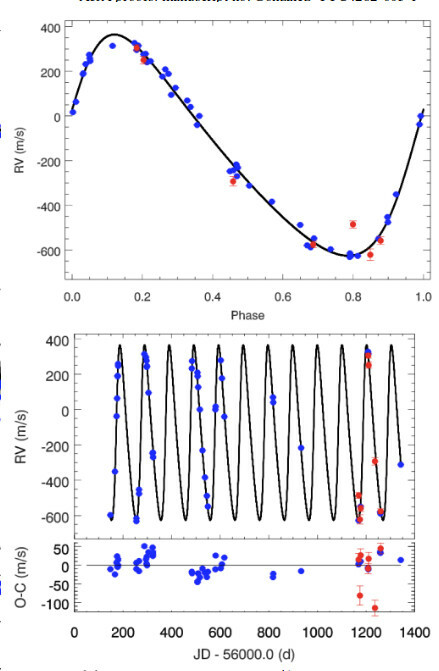 Both optical and NIR radial velocities showed consistent variations with a period at 101 days and similar amplitude, pointing to the presence of a companion orbiting the target star. Further analysis allowed to estimate a mass for the planet included in the range between 10 and 40 Jupiter Masses. Evolutionary track followed by TYC 4282-605-1, classify the giant as a 10.1 Gyr star (~ 2 times the age of the Sun), being therefore an old giant star with mass 0.97±0.03 solar masses. "Because of its proximity to the star, it is likely that the planet will be swallowed up by the star pretty soon, in astronomical terms," explains Giuseppina Micela, Director of the INAF - Astronomical Observatory of Palermo and one of the authors of the discovery. "This may be the reason why planets so close to red giant stars are so uncommon." Further studies like this will benefit of the ongoing efforts at the TNG to use HARPS-N and GIANO in a simultaneous way. The project, called GIARPS, will consist in using GIANO and HARPS-N in parallel to take one high resolution spectra in the wavelength range from 0.383 nm to 2.45 nm with two simultaneous exposures. During the last months the observing capabilities of GIANO have been improved by replacing the fiber-fed system with a mirror-fed one that overcomes the typical modal noise of the fibers. Moreover the forthcoming calibration Iodine absorbing cell will provide a much more stable wavelength reference than the actual one obtained with the atmospheric telluric lines. Once fully operative at the TNG, GIARPS will shed light on the origin of the radial velocity variations observed in the stars spectra, crucial to disentangle the star-like components by those produced by the presence of a planet.